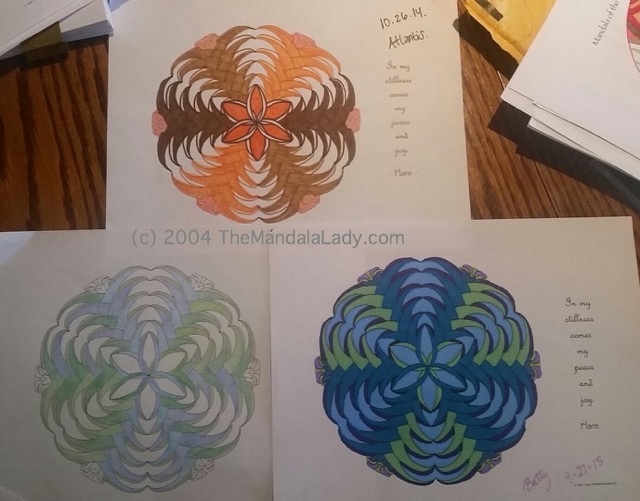 My dear coloring friend, Michelle, and her friends did something I like to encourage colorers to do: color a mandala design more than once…especially my mandala designs…I’m a bit biased. For me it’s fascinating to see the different approaches different people take. And in this case, three different people, three different colorings, three different times. While two of them used similar colors, their intensity of colors are different. And because of the differences they all have a different feel to them…making them almost seem like completely different designs. Same design. I did the top one in October 2014 and the left one I did not date it (gasp!). The one on the bottom right is Betty’s, which she did September 27, 2015. You can find the “Flare” mandala in my In the Garden Mandala Coloring Book: in my etsy shop (paper version) or in my Gumroad shop (digital/PDF version). So have you colored a mandala more than once? Were the results different? What was going on differently when you colored them? If you have yet to try it, I highly encourage you to do so. It’s fun stuff! You may even gain some interesting insights about yourself in the process.